Design for Manufacturing and Assembly (DFMA) is a well-established technique in product design for minimizing production costs and development time by designing products into utilizing the simplest components. DFMA is a practical design approach that allows for early consideration of manufacturing and assembly aspect of production as it is a combination of Design for Manufacturing (DFM) and Design for Assembly (DFA) methods. DFA focuses on the part consolidation for ease of assembly process. Meanwhile, DFM focuses on reducing the manufacturing cost [1G. Boothroyd, P. Dewhurst, and W. Knight, Product Design for Manufacture and Assembly., 2nd ed Marcel Dekker: New York, 2002.]. As the basic principles of DFMA are to reduce part, it plays a key role in product development, especially in industries like automotive, in which variation in component geometry is obvious. The final aim of this approach is to give higher profit to the manufacturer [2J.P. Kovalchuk, O. Canciglieri Júnior, and A. Batocchio, "Concurrent Engineering application on the development of parts for the White Goods industry in Brazil-A case study", In: Proceedings of the 2006 Conference on Leading the Web in Concurrent Engineering: Next Generation Concurrent Engineering, 2006, pp. 805-817.] due to its capability to improve the design efficiency and minimizing production cost without sacrificing customers’ needs [3N. Mendoza, H. Ahuett, and A. Molina, "Case Studies in the Integration of QFD, VE and DFMA during the Product Design Stage", In: Proceedings of the 9th International Conference on Concurrent Engineering, Espoo, Finland, 2003. Available from: http://www.ico.org]. The DFMA method provides a systematic procedure to determine the candidate for elimination/consolidation based on the prescribed criteria. It also facilitates the designer with design guidelines that are extracted from a good design practice for the redesign of an existing part. However, the guidelines for decreasing the part count for elimination or consolidation are limited to only by two types which are fasteners and connectors [1G. Boothroyd, P. Dewhurst, and W. Knight, Product Design for Manufacture and Assembly., 2nd ed Marcel Dekker: New York, 2002.]. The significant benefits of DFMA are avoiding potential errors in manufacturing thus reducing remanufacturing costs of products. In addition, DFMA also provides indefinable benefits such as improving communication among the design team, thus promoting teamwork and increasing ownership among team members. The activities within DFMA framework brings manufacturing personnel into the early stage of the design cycle and allows for the knowledge integration that does not happen in the traditional design approaches. DFMA considerations lead to simplification and standardization of design and manufacturing processes. It also facilitates the integration of function and form and optimizes the workflow. There are many reported examples of the application of DFMA for the design improvement from the production point of view. Prakash et al. [4W.N. Prakash, V.G. Sridhar, and K. Annamalai, "“New product development by DFMA and rapid prototyping”, ARPN", J. Eng. Appl. Sci. (Asian Res. Publ. Netw. ), vol. 9, no. 3, pp. 274-279, 2014.] redesigned a fluid flow control valve to obtain an optimum design solution for an existing product through intensive use of DFMA throughout the product development phase. Later, they employed a rapid-prototyping process to develop a prototype for testing and validation of the new design of a valve. An optimum design, low cost and good quality with quick product delivery of the valve was achieved through the DFMA approach. In another report, the cost saving of 1.8% in the subsystem and 0.7% of the entire diesel engine were attained with the application of the DFMA method [5C. Estorilio, and M.C. Simião, "Cost reduction of a diesel engine using the DFMA method", Prod., Manag. Dev., vol. 4, no. 2, pp. 95-103, 2006.]. Sula and Bâlc [6S. Sula, and N. Bâlc, "Redesign a metering pump using DFMA techniques: A case study", In: The 11th International MTEM Conference, Romania, 17-19 October 2013.] presented results of the successful validation process of a redesigned metering pump using the DFMA method. The redesign process was performed by conducting DFA analysis on the metering pump. The validation of the newly developed design strategies was conducted using a test bench. The results showed that the improvements not only shortens the assembly process, but it also streamlined the product shapes. The DFMA technique has been utilized intensively in industry for many years in order to increase the quality, decrease the cost and shorten the cycle time of a product. 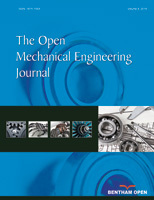 Another article discusses the detail application of this method in improving a pneumatic piston design as the design efficiency of the product increased significantly from 25.9% to 67.45% [7"Mustofa, “Redesign of pneumatic piston using design for manufacture and assembly (DFMA) technique", J. Mech., vol. 1, no. 1, pp. 60-66, 2010.]. Even though the DFMA method was not purposely designed for supporting eco-design but its impact for environmental conscious is vital. Design for sustainability or eco-design is the systematic consideration about the performances of products being designed with respect to environmental, health, and safety in its life cycle phase [8J. Fiskel, and K. Wapman, "How to design for environment and minimize life cycle cost", In: IEEE International Symposium on Electronics & the Environment, San Francisco, CA, 1994.]. There are many eco-design tools available including design guidelines, checklist methods, Life Cycle Analysis (LCA), Quality Function Deployment for Environment (QFDE), Environmental Effect Analysis (EEA), Eco-Value Analysis (Eco-VA) and Theory of Inventive Problem Solving (TRIZ). However, all of these methods attend to the environmental issue at the different stages of the product’s life cycle and they require a massive input data for analysis. Recently, manufacturing organizations recognized sustainability as a value added to their survival in the competitive market. This situation has created pressure to design engineers to search for an appropriate approach in creating environmental-friendly products. In response to this demand, Suresh et al. [9P. Suresh, S. Ramabalan, and U. Natarajan, "Integration of DFE and DFMA for the sustainable development of an automotive component", Int. J. Sustainable Eng., vol. 9, pp. 1-12, 2016.] proposed an integration of Design for Environment (DFE) and DFMA as a new methodology as an environmentally-conscious design approach. Thus, to remain competitive in the market, it is necessary for a company to assess the eco-design status of their product as compared to their competitors. According to Gheorghe and Ishii [10R. Gheorghe, and K. Ishii, "Eco-design value alignment: Keys to success", In: ASME 2007 International Mechanical Engineering Congress and Exposition, 2007, pp. 267-277. ], it is possible to focus on a specific stage of the life cycle, such that the environmental impact is minimized at that stage as well as emphasizing the entire life of the product. Thus, the application design efficiency as eco-indicator is possible as it relates to the number of components. In production point of view, the number of component of a product is directly reflected in the eco-design status of a product [11J.C. Braga, "M.L.A.C de Castro and M.T.D.M Colessanti, “Method of decision-making applied to the analysis of the environmental performance of a product: The case study of a Spirit fan", Strat. Des. Res. J., vol. 6, no. 2, pp. 46-57, 2014. [http://dx.doi.org/10.4013/sdrj.2013.62.01] ]. The sustainability of product before and after improvement has been made with the aid of DFMA approach was compared to investigate the environmental impact. The result of the study has proven that the product after improvement possesses minimal environmental impact. Thus the integration of DFE and DFMA is beneficial to improve the sustainability of the product [11J.C. Braga, "M.L.A.C de Castro and M.T.D.M Colessanti, “Method of decision-making applied to the analysis of the environmental performance of a product: The case study of a Spirit fan", Strat. Des. Res. J., vol. 6, no. 2, pp. 46-57, 2014. [http://dx.doi.org/10.4013/sdrj.2013.62.01] ]. The aforementioned study strengthens the applicability of DFMA for eco-design assessment. Therefore, this research attempts to assess the eco-friendly of a consumer product by measuring its design efficiency with the application of DFMA method. 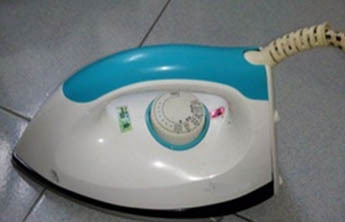 In consideration of the research objectives, two brands of electric dry iron that are called dry iron A (produced by a reputable company) as in Fig. 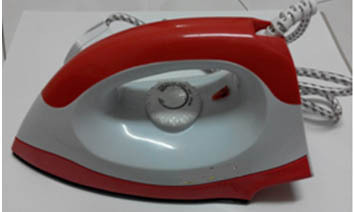 (1 ) and dry iron B (produced by a non-reputable company) as in Fig. (2 ) were selected as a case study. The dry irons were selected due to their availability, usage and significant contributions to the total household energy consumption. Since the research aims to compare these two products based on the design efficiency, the influence of an electrical consumption of these products in the usage phase was ignored as both of them have a similar specification which is operating at 240V with a maximum power of 1000W. These products were disassembled and the dimension of each component was measured with a vernier caliper. The detail drawing of each component was reproduced with the use of CATIA V5R20 solid modeling software. The design efficiency of both products was computed based on the Boothroyd Dewhurst DFMA procedure. Indirectly, the Boothroyd Dewhurst method provides a quantitative measure of the product eco-friendliness that is also called the design efficiency as it is the ratio of the theoretical average assembly time of a part of the estimated total assembly time of an actual product. Theoretically, less number of parts in a product will contribute to the higher design efficiency that indicates the eco-friendly status of a product in relative. The design efficiency analysis was carried out based on two factors, namely 1) consideration of the possibility to eliminate the part or to combine with other parts of the assembly, and 2) consideration of the estimated time taken to grasp, manipulate, and insert the part. The following procedure was adopted to apply the DFMA in the dry irons case. The existing products were identified, obtained and the detail designs of the products reproduced with the aid of CATIA. Reconstruction of the products was carried out in another way round, where the parts with the highest identification number were assembled first as they were inner parts and the whole assembly ended up with part 1 (outer parts or the part that disassembled first). Then, the Boothroyd Dewhurst assembly worksheet shown in Table 1 was filled up. where, EM = design efficiency, NM = estimation for the theoretical minimum part, and TM = Assembly time, TA = is taken as 3, based on the average value of theoretical assembly time. Design for manual assembly worksheet. Rule 1 is about the movement of the part: Does this part move relative to all other parts that are already assembled in the system? Rule 2 is about the isolation of part: Must this part be made of different material than other parts already assembled in the system? Rule 3 is about adjustment/replacement of parts: Must this part be separated from all other parts already assembled in the system? If the answer to any of these questions is “Yes,” the number “1” is entered in column 8 as it is an essential part and “0” for the non-essential part. Table 2 shows the two examples of how the theoretical minimum part count was analyzed for the dry irons. The knob ring was considered theoretically non-essential as all the answers for the rules are “NO.” Meanwhile, the knob was considered theoretically essential part of the dry iron because all the answers are “YES.” Thus, column C8 of knob ring and knob are filled with “0” and “1” respectively. Based on the analysis, there are six essential theoretical parts for both dry irons as shown in Tables 3 and 4. The outline of standard procedure as in [1G. Boothroyd, P. Dewhurst, and W. Knight, Product Design for Manufacture and Assembly., 2nd ed Marcel Dekker: New York, 2002.] was followed in order to fill in the columns C1 through C7. Since the recommended time taken for manual insertion of the part was stated in the standard table that was provided in [1G. Boothroyd, P. Dewhurst, and W. Knight, Product Design for Manufacture and Assembly., 2nd ed Marcel Dekker: New York, 2002.] which is based on theoretical values, the influence of assembly as mentioned in [12M.R. Bahubalendruni, B.B. Biswal, M. Kumar, and R. Nayak, "Influence of assembly predicate consideration on optimal assembly sequence generation", Assem. Autom., vol. •, pp. 309-316, 2015. [http://dx.doi.org/10.1108/AA-03-2015-022] , 13M.R. Bahubalendruni, and B.B. Biswal, "“A review on assembly sequence generation and its automation”, Proceeding of the Institution of Mechanical Engineer, Part C", J. Mech. Eng. Sci., vol. 230, no. 3, pp. 824-838, 2015.] was ignored in this study. The analyses as in Sections 2.2 and 2.3 were repeated for the newly improved designs for internal validation and the result of the analysis is shown in Table 6. STEP 1: IF the value in column 8 (C8) LESS THEN the value in column 2 (C2), THEN it was considered as an opportunity to reduce the number of parts. STEP 2: Check columns 4 (C4) and 6 (C6). These figures indicate potential for assembly time reduction. Based on product disassembly of the both dry irons, dry iron A has 24 components and dry iron B has 20 components. The example of the theoretical minimum part count of dry iron. Design efficiency of the dry iron A. Design efficiency of the dry iron B. The design efficiency of two different brands of the product was analyzed using Boothroyd Dewhurst DFMA methods for manual assembly. The design efficiency of the product was calculated based on equation (1). Tables 3 and 4 show the analysis result of the dry irons A and B. The total assembly time of dry iron A was 204.14s with 6 theoretical minimum part count that leads to the design efficiency of 8.82%. The total assembly time of dry iron A was 174.08s with 6 theoretical minimum part count leading to the design efficiency of 10.34%. Based on this result, there are 7 components of the dry iron A (knob ring, handle, vertical cord lift, back cover, sole back plate, screw A and B) and 4 components of the dry iron B (handle, vertical cord lift, screw A, and B) can be eliminated due to the value in column 8 being smaller than in column 2. The modification for the design improvement was carried out on dry iron B based on its DFMA analysis. In general, some of the components were suggested to be eliminated and some modifications have been implemented in the components. The handle, vertical cord lift and a few screws were eliminated while the casing of the handle and vertical cord lift were combined into one component. Instead of using several screws and locating pin, the snap fit principle was employed to replace the existing method. Another modification was adding a slide button on the sole plate cover for ease of releasing or attaching with the casing. This method requires less time for the installation and the screws is unnecessary as shown in figures of Table 5. Table 5 shows the modification suggested for the dry iron design. The original design and new design are shown and explained in the table. The reason for modification of the design and the differences between them are also explained. It was obvious that the new design fulfilled the objectives of the project in term of reducing assembly time and directly improved the percentage of design efficiency of the new design. Suggestion of design modifications for dry iron B. The analysis found that the design efficiency of the new dry iron B is 18.08% and the total assembly time is 132.73s with 8 theoretical minimum parts count as shown in Table 4. Analytical results of the new dry iron. Comparison between existing design and new design. As shown in Table 7, dry iron B contains 10 different parts with a total of 20 components. After modification, the new design of dry iron B contains 10 different of parts with a total of 16 components. It was clearly shown that the total number of components for the new design is less by 4 components compared to existing design of dry iron B. Some of these components were combined as a single component and some unnecessary components/features were eliminated. The DFMA analysis results shown the percentage of design efficiency of new conceptual design is 18.08%. Due to this reason, the new dry iron has a higher percentage of design efficiency compared to both existing dry iron. The number of components and assembly method are the important factors affecting the design efficiency of a product. In this research, the number of total components of the new dry iron was reduced from 20 components to 16 with the application of the DFMA analysis. The total assembly operation time reduced from 174.08s to 132.73s. It obviously shortens the assembly time by about 41.35s or 23.75%. The reduction of assembly time is contributed by the elimination and combination of certain components based on DFMA analysis result. This reduction in the component will ultimately improve the eco-friendliness of the product. The authors gratefully acknowledged the financial support from Universiti Teknikal Malaysia Melaka (UTeM) and The Ministry of Higher Education, Malaysia (MOHE). G. Boothroyd, P. Dewhurst, and W. Knight, Product Design for Manufacture and Assembly., 2nd ed Marcel Dekker: New York, 2002. J.P. Kovalchuk, O. Canciglieri Júnior, and A. Batocchio, "Concurrent Engineering application on the development of parts for the White Goods industry in Brazil-A case study", In: Proceedings of the 2006 Conference on Leading the Web in Concurrent Engineering: Next Generation Concurrent Engineering, 2006, pp. 805-817. W.N. Prakash, V.G. Sridhar, and K. Annamalai, "“New product development by DFMA and rapid prototyping”, ARPN", J. Eng. Appl. Sci. (Asian Res. Publ. Netw. ), vol. 9, no. 3, pp. 274-279, 2014. C. Estorilio, and M.C. Simião, "Cost reduction of a diesel engine using the DFMA method", Prod., Manag. Dev., vol. 4, no. 2, pp. 95-103, 2006. S. Sula, and N. Bâlc, "Redesign a metering pump using DFMA techniques: A case study", In: The 11th International MTEM Conference, Romania, 17-19 October 2013. "Mustofa, “Redesign of pneumatic piston using design for manufacture and assembly (DFMA) technique", J. Mech., vol. 1, no. 1, pp. 60-66, 2010. J. Fiskel, and K. Wapman, "How to design for environment and minimize life cycle cost", In: IEEE International Symposium on Electronics & the Environment, San Francisco, CA, 1994. P. Suresh, S. Ramabalan, and U. Natarajan, "Integration of DFE and DFMA for the sustainable development of an automotive component", Int. J. Sustainable Eng., vol. 9, pp. 1-12, 2016. R. Gheorghe, and K. Ishii, "Eco-design value alignment: Keys to success", In: ASME 2007 International Mechanical Engineering Congress and Exposition, 2007, pp. 267-277. J.C. Braga, "M.L.A.C de Castro and M.T.D.M Colessanti, “Method of decision-making applied to the analysis of the environmental performance of a product: The case study of a Spirit fan", Strat. Des. Res. J., vol. 6, no. 2, pp. 46-57, 2014. M.R. Bahubalendruni, B.B. Biswal, M. Kumar, and R. Nayak, "Influence of assembly predicate consideration on optimal assembly sequence generation", Assem. Autom., vol. •, pp. 309-316, 2015. M.R. Bahubalendruni, and B.B. Biswal, "“A review on assembly sequence generation and its automation”, Proceeding of the Institution of Mechanical Engineer, Part C", J. Mech. Eng. Sci., vol. 230, no. 3, pp. 824-838, 2015.